“The ‘homophobe’ deluge might have been bearable if the Irish Times had behaved with a scintilla of integrity during it. Instead, it seemed to join gleefully in the witch-hunt, publishing a series of outrageously one- side articles directed at me or the Iona Institute, sometimes carrying splenetic or sarcastic asides in articles which had nothing to do with the controversy. 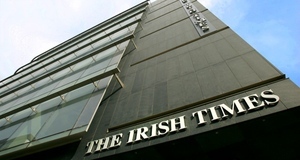 There were also frequent attacks on me by Irish Times ‘colleagues’ on Twitter, most notably the Consumer Affairs Editor Conor Pope, who had been tweeting in a derisive fashion about me, which I believe to be in direct contravention of the Irish Times social media policy. Following an intervention on my behalf, the Deputy Editor Denis Staunton instructed Pope to remove these tweets, which he did. On February 7th, a review of a movie by the paper’s film critic Donald Clarke included the following sentence: “Given recent, unhappy developments in domestic discourse, there could hardly be a better time for a film about a homophobic jerk – partly fictionalised and entirely dead, so he can’t sue”. Nothing was done to discourage or inhibit the attacks. This was the newspaper for which I’d worked for 24 years. These people knew me and knew how far off the mark the depiction of me as a homophobe was. Everyone sat there enjoying the spectacle of me being savaged. On February 4th, in the wake of Fintan O’Toole’s utterly cowardly and disgraceful attack, I resigned as a columnist with the Irish Times by sending an email to Denis Staunton at midnight. Staunton was my sole point-of-contact in the newspaper, the editor having all but ignored me since his appointment in 2011. Following a discussion between Denis Staunton and Kevin Brophy, I agreed to put my resignation “on ice” and continue with a five-week leave period I’d negotiated to work on two books I was writing. I believe I would have eventually withdrawn my resignation, as Denis Staunton indicated he wanted me to do, had it not been for what happened next. 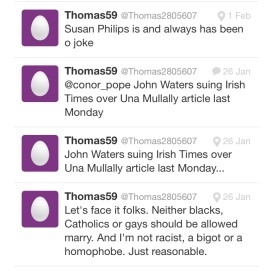 Perhaps the most sinister development over the course of the entire saga was the unearthing of the phantom tweeter, Thomas59…. My internet sleuths followed Thomas59’s tweets back to the point when he initiated his Twitter account. There they found that, either carelessly or naively, he had given away his true identity in several ways, including by supplying his work email address for someone he was requesting to contact him. He had also neglected to disable the GPS facility on his mobile device, which meant that, every time he tweeted, he revealed his precise location – sometimes his flat in southside Dublin, sometimes his local public house, and some- times the offices of the Irish Times on Tara Street, Dublin. 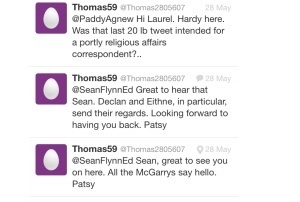 Thomas59 was revealed in all his glory as a longtime senior correspondent with the Irish Times [Irish Times Religious Affairs correspondent Patsy McGarry, whom the author had regarded as a friend]…. ….It is clear to me that such attacks were provoked out of the deeply noxious atmosphere of antagonism which had been allowed to fester towards me for many years inside the Irish Times growing exponentially worse in the years since Kevin O’Sullivan became Editor. 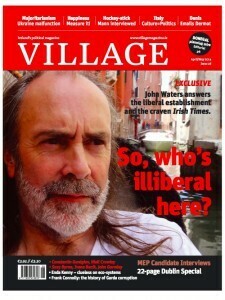 An extract from an article by John Waters in Village magazine, out now. Phoenix says the phrase ‘corporate bullying’ has started appearing in correspondence between John Waters’ solicitor and the Irish Times. 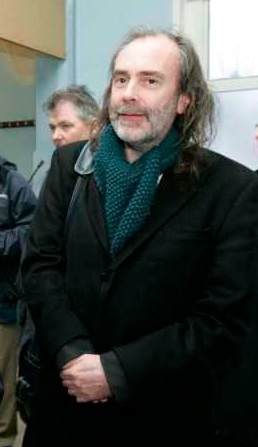 Posted in Misc and tagged irish times, John Waters, Village at 11:53 am on April 11, 2014 by Broadsheet.